This 4-day workshop is designed to: introduce bodywork concepts, relevant anatomy in practical detail, and structural techniques to create space in a pregnant person’s body for the baby to find their best position. Develop assessment skills to identify structural imbalances throughout pregnancy and appropriate interventions to improve comfort during pregnancy, reduce preterm and long labors, and improve birth outcomes. Improve skills in patient/client education to facilitate greater autonomy and compliance with recommendations. Explore concepts originating in Fasciatherapy Dani Bois Method (DBM) to provide an introduction powerful enough to transform the presence practitioners bring to their current work. The material presented is designed to guide the participant through perceptual introspections that develop the internal richness of experience. 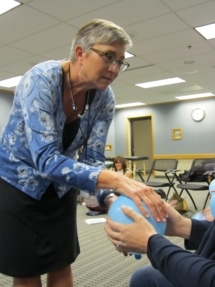 Focus on how to integrate the new principles and techniques learned into participants existing practice and own session flow with pregnant clients/patients. These four-days immerse practitioners in the Spinning BabiesTM paradigm by promoting a gentle approach to care and awareness of the baby, body, and pregnant person. Each day will include a combination of education, training, hands-on practice, and professional coaching by founding educators Debra McLaughlin, Adrienne Caldwell, and Marcello Windolph. Your personal exploration of concepts originating in Fasciatherapy (Method Danis Bois) provide an introduction powerful enough to transform the presence you bring to your current work. We have incorporated professional coaching sessions to focus on how to integrate what you learn into your own session flow. These four-days immerse you in the Spinning Babies® paradigm. There is nothing like this in the bodywork world.